Elvis Presley performing at Market Square Area, Indianapolis, June 26, 1977. Courtesy of ElvisPresleyPhotos.com. Elvis Presley, known around the world as the King of Rock ‘n’ Roll, thrilled audiences for decades with his legendary swagger, good looks, and unique vocal stylings. 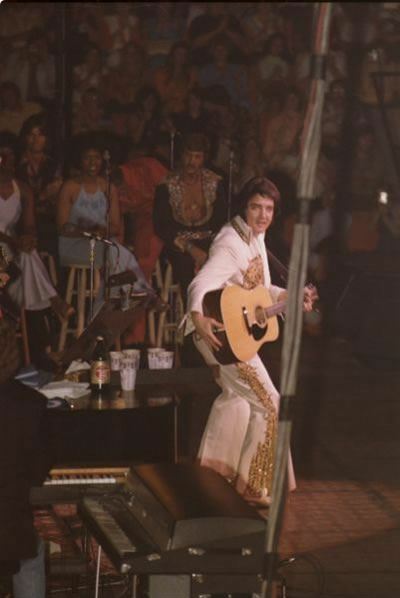 Among his many concerts over the years, the one that garners much historical attention is the final one, at Indianapolis’s Market Square Arena on June 26, 1977. His final performance, to a crowd of nearly 18,000 people, inspired copious press attention. 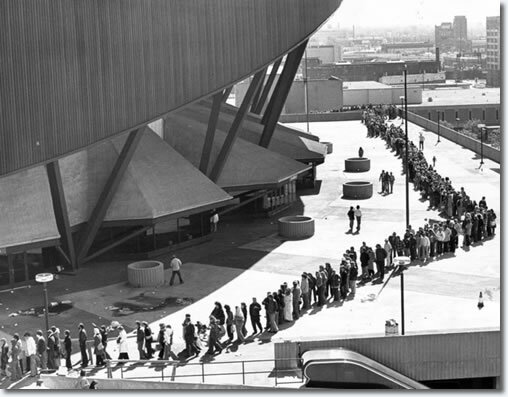 Fans lining up to purchase Elvis tickets at Market Square Arena. Courtesy of ElvisPresleyPictures.com. An article in the Indianapolis News on June 25 listed it as a requisite event for music fans. 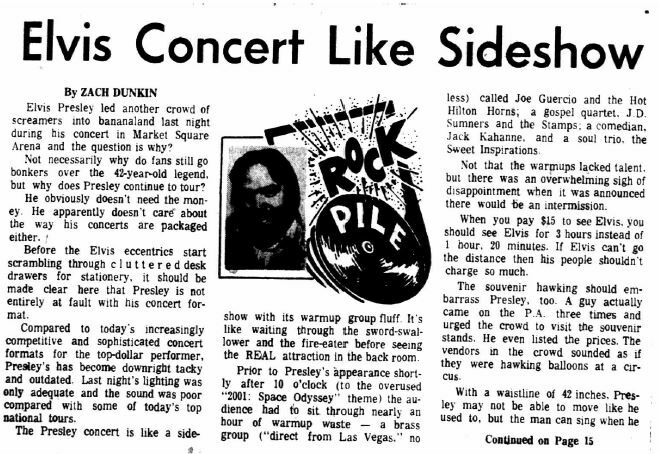 The Indianapolis Star noted playfully “If you admire Elvis Presley’s back you still can buy $15 seats behind the stage for his concert at the Market Square Arena tomorrow night.” While $15 doesn’t sound like much, that’s the equivalent of nearly $60 today. A ticket stub from Elvis’s final concert at Market Square Arena, June 26, 1977. Courtresy of ElvisPresleyPictures.com. 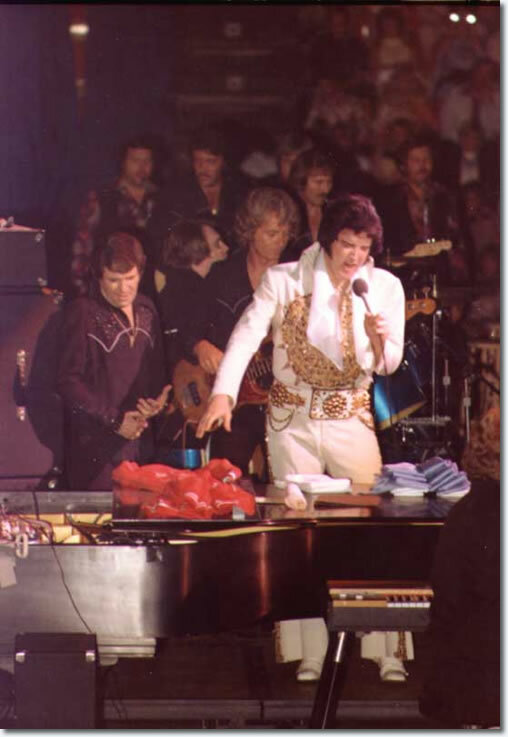 The concert began at 8:30 p.m., but Elvis didn’t perform until 10 p.m.; warm-up acts of brass bands, soul singers, and a comedian filled time before the King. 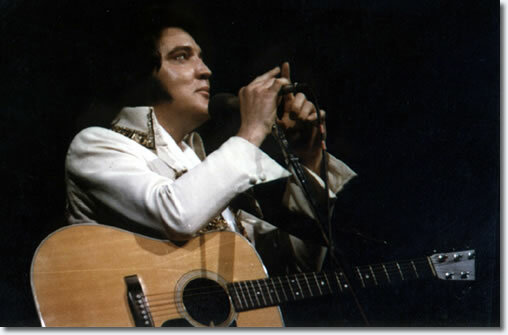 Then for about 80 minutes, Elvis sang both his classic tunes like “Jailhouse Rock” and “Hound Dog,” and his more somber numbers, like “Hurt” and a cover of Simon & Garfunkel’s “Bridge over Troubled Water.” He closed the concert with “Can’t Help Falling in Love with You,” one of his most poignant ballads. He reportedly told the audience “We’ll meet you again, God bless, adios” as he left the stage. Based on filmed footage, the crowd appeared enthusiastic about the performance; the local press, however, was a bit skeptical. The big question was, of course, had he lost weight? His last concert here, nearly 2 years ago, found Elvis overweight, sick and prone to give a lethargic performance. As the lights in the Arena was turned down after intermission, you could feel a silent plea rippling through the audience: Please, Elvis, don’t be fat. 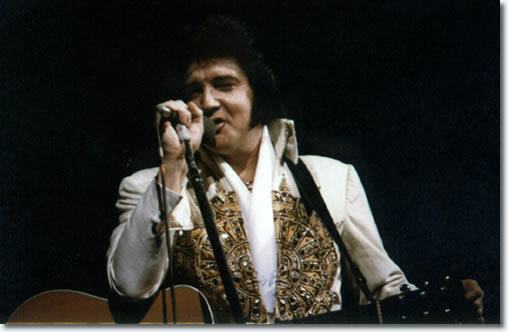 She assuaged readers, writing “At 42, Elvis is still carrying around some excess baggage on his midsection, but it doesn’t stop him from giving a performance in true Presley style.” She noted glowingly how well he sang some songs, including “It’s Now or Never,” and “This Time You Gave Me a Mountain.” Rose’s piece emphasized the better elements of the concert and the excitement of the crowd. The first page of Zach Dunkin’s critical piece on Elvis’s last concert. Image courtesy of Indiana State Library. Sadly, Presley never got the chance to do better, for his show in Indianapolis was his last. After the concert at Market Square Arena, Elvis took a break from touring and returned home to Graceland. Nearly six weeks after his Indianapolis concert, Elvis died in his home on August 16, 1977 from heart failure, likely caused by years of prescription drug abuse. 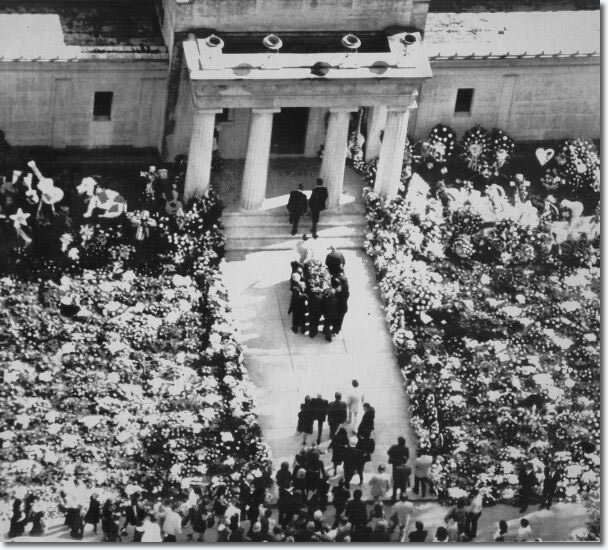 Elvis’s casket being carried into Forest Hills Cemetery, Memphis, Tennessee, August 19, 1977. Courtesy of ElvisPresleyPhotos.com. For months afterward, Dunkin received scores of angry letters from fans of Elvis for his unfavorable review. In an interview with John Krull, Dunkin talked about the hate mail he received, particularly attacks against his personality and his supposed “envy” of Elvis. Yet, other letters (in his estimation about “20 percent”) were sympathetic, with one letter saying the King “should’ve stayed home.” Dunkin’s review still receives attention from fans of Elvis and students of music history. A historical marker commemorating Market Square Arena and Elvis’s final concert. Market Square Arena was demolished in 2001. Courtesy of Pinterest/ElvisCollector.info. Market Square Arena was demolished in 2001 and it is now a parking lot. 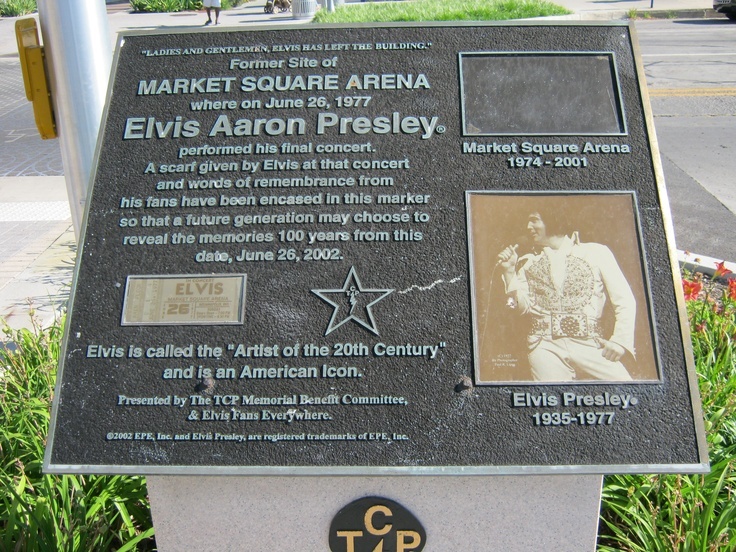 A memorial marker for the arena commemorates its history and importance as the venue for Elvis Presley’s final concert. Elvis Presley’s mark on American music and culture is permanently etched into stone, but his controversial final concert showed the complications and problems associated with his final years. Regardless of the quality of the concert, it will be remembered forever as the place where the King took his final bow.